Piso Fare Promo 2019: Are you just like us waiting for a Piso Fare? Well, here is form AirAsia folks! For as low as Php 16 All-in one way ticket fare, you can book a ticket that's if you're lucky to be coming from Clark (Pampanga) airport. 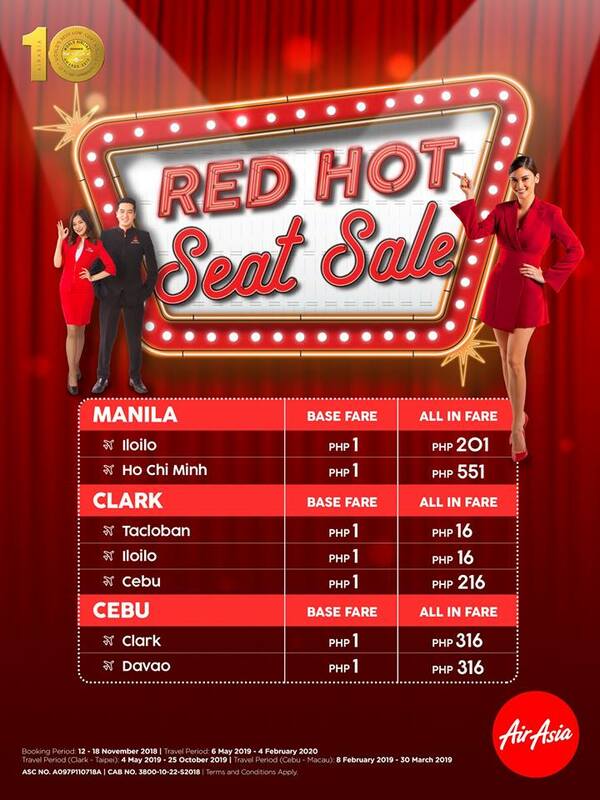 This is their #RedHotSeatSale that their avid passengers can avail. Of course, more PROMOS you can find at the SIDE and TOP of this post. Feel free to click and check them. For those coming from other base stations like Manila, the lowest fare you can book for a one way ticket flights is Php 201. If coming from the Queen City of the South, Cebu, Lowest fare you can buy online is Php 316. Manila to kalibo piso fare meron po ba?! Meron po bang davao to manila? meron p po bng promo may 2019? Magkano po Bacolod to manila last week ng may to first week ng june 2019. Mgkano po ang ticket from davao to manila 2nd week of April, 2019? Then Manila to Davao 2nd week of May 2019? Any cheapest fare from siargao to davao vise versa. puerto prinsesa to iloilo piso rate mayroon po ba?